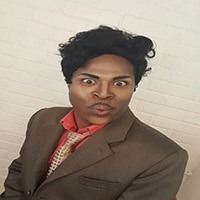 Best Little Richard Lookalike Impersonator Tribute Artist. In January 1986, the inaugural Rock and Roll Hall of Fame induction dinner was held at New York City’s Waldorf Astoria Hotel. In January 1986, the inaugural Rock and Roll Hall of Fame induction dinner was held at New York City’s Waldorf Astoria Hotel. The inductees included many of rock and roll’s originators, including Elvis Presley, James Brown, Fats Domino, The Everly Brothers, and Buddy Holly, to name a few. 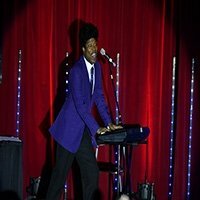 Best Little Richard Lookalike Impersonator Tribute Artist was an aspiring teenage musician at the time, and four of the first time inductees struck a major chord with him; Little Richard, Chuck Berry, Ray Charles, and Sam Cooke. These artists were giants in his eyes. They were world class musicians, songwriters, producers, arrangers, showmen, business owners and all African American. He wanted to be just like them. Later that year, something unexpected and amazing happened. After receiving offers from New York, Philadelphia, New Orleans, San Francisco, Memphis and Chicago, the decision was made to build The Rock and Roll Hall of Fame in the city where he was born and raised, Cleveland, OH. He was ecstatic and inspired, now more than ever, to continue his musical journey. These artists and many more of the soul, blues, and early rock artists from the 50’s and 60’s shaped his entire musical landscape. His mission now is it to celebrate their music and educate listeners on their enormous contribution and influence. He is an Award Winning Little Richard Tribute Artist. Even with all of this success, he has never forgotten where he came from and the artists that inspired him as a child.